played on Saturday, 24 September 2005 at 3pm. After five successive defeats, Cambridge bounced back to beat a depleted Altrincham side comfortably. After 14 minutes, the Alty defence backed off to allow Pitt to score. Three minutes later Onibuje got past Melling to sidefoot home. In the second half, Altrincham had the better of the game for almost half an hour with Hendley looking especially lively. But they faded in the final stages, allowing Onibuje to score again (78 mins). On 82 minutes Atkins added a fourth after a Coburn parry. Alty dropped to fifteenth. The only previous meetings between these sides had been a friendly at Moss Lane in August 1967 which Altrincham had won 7-1. Cambridge were under pressure today after five successive defeats, whilst Alty had only picked up one point from their last three games. Both sides had also had trouble scoring in recent weeks, though the “U”s did get three whilst conceding five in midweek. It used to be that visiting the UniBond League grounds brought the stranger experiences for Alty fans – the three-sided pitch at Bishop Auckland, the slag-heap backdrop at Frickley and the cavernous Halton Stadium with its 200 spectators for example - but this season it is the large former league clubs’ ground which are providing the most bizarre moments. The away entrance at Aldershot was a precipitous descent along a wooded path; the York City policy of confiscating bottle tops was amazing whilst, today, the police-imposed route to the Abbey Stadium involved, firstly, a detour of several miles for the supporters' coach on and from the A14 which took us to a designated drop-off point outside a public house a half-mile from the ground. 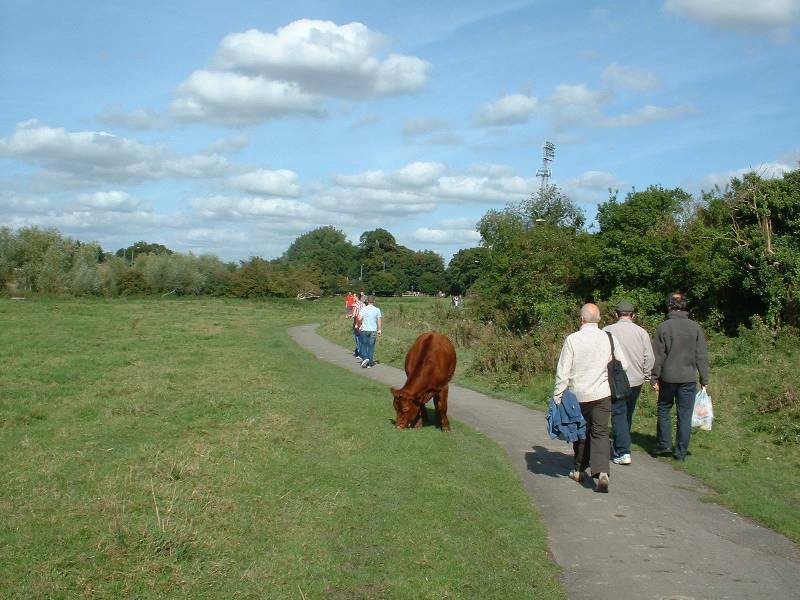 The route from there to the ground was an unsigned pathway through an open field protected by cattle grids in which a herd of cows was grazing. Negotiating the cow pats on a sunny afternoon was not too bad, but doing so for an evening fixture would be interesting. The walk there and back was also a struggle for some of our older supporters. Once inside, the stadium itself was impressive and provided good facilities for away fans behind the goal in a newish all-seater South Stand. The matchday programme was an excellent production – all-colour and with plenty of information. Above: Alty fans dodge the cow pats on the half-mile hike through a field of unfenced cattle from the dropping off point dictated by Cambridgeshire Constabulary for away fans' supporters coaches at Cambridge United. Even the drop-off point was only reached after a diversion from the direct route of several miles from the A14, again at the behest of the Constabulary. The ground's floodlights are visible on the horizon. In addition to their long-term injured, Eddie Hussin, Gary Scott, Steve Aspinall, Lutel James and Richard Norris (not to mention Marcus Hallows), Alty were also without the more recently injured Colin Potts, Gary Talbot and Chris Adams today. So, Kirk Hilton played at left-back, George Melling at centre-back and Kieran Lugsden started on the right. Only five of the starting line-up from the Conference Play-Off final are currently fit to play and six of today's starters had started fewer than half of the matches played this season in the Conference National. CAMBRIDGE UNITED: (Yellow and black shirts, black shorts, yellow socks): 13. Scott HOWIE, 2. Dan GLEESON, 5. Mark PETERS, 8. David BRIDGES, 9. Fola ONIBUJE, 11. Parys OKAI, 15. Adam DAVIES, 18. Stephen SMITH, 28. Ritchie HANLON, 29. Courtney PITT, 30. Craig WESTCARR. Subs: 4. Andy DUNCAN, 10. John TURNER, 14. Paul ATKINS, 16. Darren QUINTON, 25. Mark ANGEL. ALTRINCHAM (Red & white striped shirts, white shorts, red socks) : 1. Stuart COBURN, 12 Steve HAWES, 24. George MELLING, 4. Mark MADDOX, 23. Kirk HILTON; 20. Kieran LUGSDEN, 8. Val OWEN, 15. Peter BAND, 16. James OLSEN; 9. Colin LITTLE, 10. Rod THORNLEY. Subs: 14. Lewis CHALMERS, 17. Karl MUNROE, 19. Gary WILLIAMS, 21. Stephen ROSE, 26. Lee HENDLEY. Alty kicked off defending the South End and were soon looking shaky at the back. After 2 minutes, Okai got to the bye-line, left of goal and his cross found the 6ft 6in Onibuje at the back post but he was only able to nod his header wide from six feet out. More lacklustre Alty defending soon allowed Pitt to find Hanlon, who shot over the bar. Belatedly, Alty came to life as Hilton, Olsen and Thornley fed Little but he delayed his shot too long and was closed down. Moments later, he did better from an Olsen pass, firing in a low shot, which Howie saved well. Soon, at the other end, Pitt shot wide (10 mins) but Alty seemed to be settling after their shaky start and almost took the league in spectacular fashion, as Hawes's cross was sent to Thornley by Davies and Rod’s superb volley only just cleared the bar (13 mins). But it was a false dawn as Cambridge went to the other end and scored twice inside three minutes. The first came when, for the second time in the game, Alty's defence stood off and allowed Pitt to advance up the middle and score with a low shot from the just outside the box, which seemed to bounce awkwardly in front of the diving Coburn (14 mins). The second arrived when the ball came from the United left to Onibuje, who turned past Melling to sidefoot home (17 mins). Soon, Cambridge won a corner but this was cleared. The referee showed leniency on several occasions such as when Westcarr deliberately threw the ball into an empty section of terrace to delay an Alty freekick and then Mr Langford failed to book Smith for a robust challenge on Olsen (20 mins). Alty remained on the back foot as Onibuje lifted a shot badly over the bar from Smith's feed (23 mins). When Peters dumped Thornley onto the pitch-surround, Mr Langford again kept his card in his pocket. From Hilton's freekick from 30 yards, Olsen sliced badly wide. Alty were misplacing passes and unable to hold the ball for any length of time with Band in midfield and Maddox in defence looking their best players, the latter blocking off Onibuje well. Lugsden got in a blocked shot and an overhit cross but neither side seriously threatened a goal at this stage (34 mins). A foul on Thornley by Davies brought a word from the ref but from Hilton's freekick, Little over-elaborated and failed to get in a shot (36 mins). Pitt then felled Band on the half-way line and the normally indestructible Alty man needed treatment. The offender again escaped with just a verbal caution (38 mins). Little had a shot blocked after which Hawes tripped his opponent and this time Mr Langford found his notebook and booked the Alty man (43 mins). Half-time arrived just after an impressive clearance by Maddox, outjumping the much taller Onibuje. After Cambridge had kicked off, they won a freekick which, from a layoff, Hanlon blasted 25 yards wide of the target (48 mins). But Alty improved and had the better of the next 25 minutes or so. They won a corner (51 mins) and then Thornley got onto Olsen's cross at the right bye-line only for the linesman to award a goalkick (54 mins). After this, the 6ft 6ins Onibuje held his arm across the 5ft 8ins Steve Hawes at a throw-in on the Alty right and as the right-back tried to free himself, Onibuje appeared to elbow him to the ground. Referee Langford saw no more than a yellow card as the appropriate punishment- whilst the home crowd booed the Alty man every time he touched the ball for the rest of the game. After 57 minutes, Alty replaced Lugsden by Hendley, with Thornley moving to right as the new man went up front. Alty continued to have the better of the play and Hendley was beginning to pose the home defence some problems with his speed and ball control. But after five throws for Alty in quick succession had maintained some momentum, Hendley was given offside (58 mins). Now, Williams replaced Olsen on the Alty left in another attacking ploy by manager Heathcote (62 mins). United’s Pitt then rode his luck, kicking the ball into the crowd after it had gone out of play. Soon, both sides made a change; Quinton replaced Bridges for the 'U's whilst the customary farce with the electronic indicator led a surprised Maddox to start to trudge off the field before a correction was made and Melling went off to be replaced by Munroe (64 mins). Band moved back to midfield as Munroe slotted into the back four. After Williams had been tripped for a freekick, Hendley did well to get to the bye-line but he overhit his cross. Up front, Williams (on the left) and Hendley (in the middle) were keeping the home defence on its toes, with the latter forcing the keeper to a good save with his legs, only to be given offside (68 mins). After treatment for the injured Owen, Maddox again did well to see off Onibuje. Okai got away with a foul throw which started a fluid move which ended with a bad miss by Smith (72 mins). This signalled the home side getting back into the game as part-time Alty faded. Nevertheless, soon afterwards, Hendley skilfully got into the box but was closed off (74 mins). Cambridge sealed the game with their third goal when Okai's cross from the left was converted by Onibuje as Munroe looked on, appealing vainly for offside (78 mins). Immediately the scorer was subbed by Atkins. As in the first-half, having conceded a goal, Alty promptly conceded another. It came as Coburn did well to parry a shot from the right by Smith, only for Atkins to drive the loose ball into the net (82 mins). With Angel now on for Hanlon, Cambridge saw Alty respond by winning two corners in succession but soon Cambridge were running at Alty again as Onibuje was announced as Man of the Match. As the final minutes ticked away, Cambridge were keeping possession. But Alty had a late let off when Band seemed to handle the ball as he threw himself in front of Smith's shot (90+3 mins). Cambridge were worthy winners and will hope that this win has revitalised their season, which had started well but then slumped. But with 17 goals conceded in 5 away games and only 2 goals scored on the road, Alty are proving bad travellers. After falling behind, as at Stevenage, York and here today, Alty have been unable to get back into games. Today, however, their good spell in the second half suggested they might do so but possession was not translated into clear goalscoring opportunities. If manager Graham Heathcote had had his first-choice eleven available this season things might have been better but with regulars such as Hussin, Scott and Aspinall missing virtually every game this season and with numerous other less serious injuries to the likes of Talbot and Adams, the gulf between Nationwide North and Nationwide National and between part-time and full-time has become apparent, away from home especially. Even so, Alty are still ahead of most of the other part-timers in the league table and these include last season’s Nationwide North champions Southport.